To choose an imagery set, you can set the Mode property of the BingRestMapProvider. The CanvasLight, CanvasDark, CanvasGray, AerialOnDemand, RoadOnDemand are not added to the toolbar of the control by default. To add them to the map view mode commands bar, you can use the RegisterSetSourceCommand() method of BingRestMapProvider. You can remove specific imagery set from the map view mode commands bar, by removing them from the Commands collection of the BingRestMapProvider. This mode offers worldwide orthographic aerial and satellite imagery. The labels in this mode are enabled by default. You can the disable labels using the IsLabelVisible property. When you set it to False the labels disappear. Figure 2 is a snapshot of the Aerial mode for Bing Map Rest Provider when the labels are not visible. 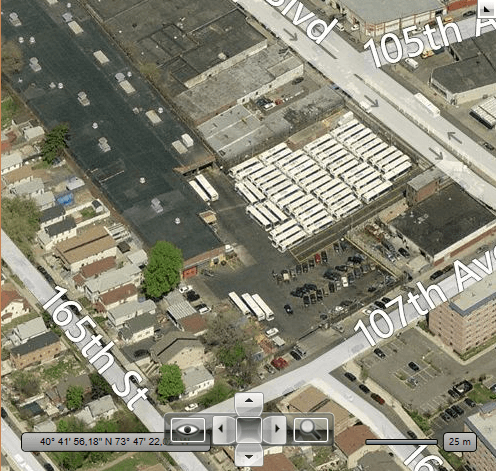 This imagery set represent Aerial imagery with on-demand road overlay. The road imagery type is a set of static tile server. The tiles are generated ahead of time and then stored and served. The Road mode of Bing Maps ignores the IsLabelVisible property. For this mode the labels are displayed always. Figure 4 is an example of the Road Mode definition. The Bing Map Rest Provider also supports the Birdseye mode. This mode can be used for high resolution levels only (zoom level 19-20). The Birdseye mode does not provide the tile images for all regions around the world. Some regions don't have images for Birdseye mode. The road on demand imagery type provides the same map tiles used in the latest Bing maps controls. These tiles are generated on the fly as needed and are the most up to date road maps. A light version of the road maps which provides neutral background with minimal colors, labels and features. A gray version of the road maps which provides neutral background with minimal colors, labels and features. A dark version of the road maps which provides neutral background with minimal colors, labels and features.